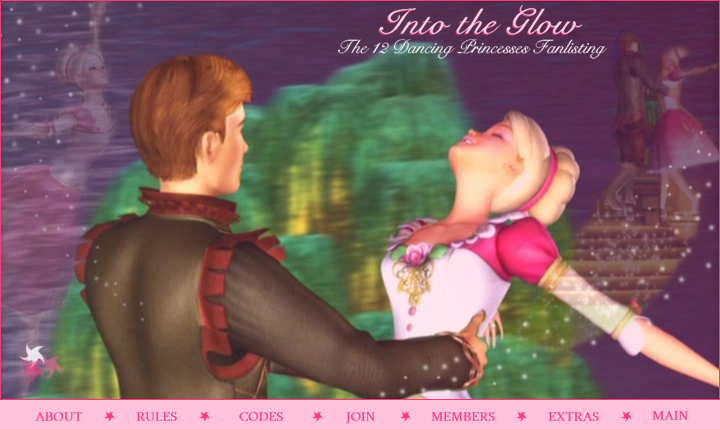 Hello, everyone, and welcome to "Into the Glow," the fanlisting for the wonderful Barbie fairytale movie, The Twelve Dancing Princesses. Use the navigation above to check out the different areas of the site, and if you're a fan of this movie, please join! Please welcome our newest member, Marley! All characters, situations, etc., dealing with Barbie in the Twelve Dancing Princesses are property of Mattel and Mainframe Entertainment. I'm not affiliated with them in any way (sadly), and I am making no money off this fanlisting; it is purely fan-based.